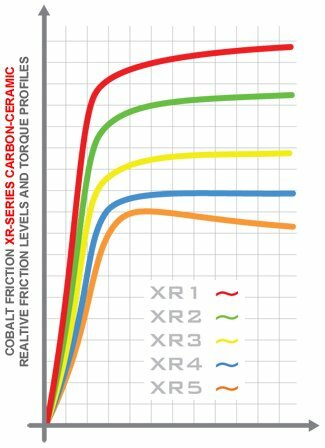 Cobalt XR1 is an extremely high torque material with an aggressive initial bite and medium-high, linear rising torque curve. Excellent friction stability and consistency coupled with very good modulation, threshold control and release characteristics over the industry's broadest operating temperature range. The XR1 material has unmatched disc life and finish versus any other competing friction material of comparable torque. Well-suited for a wide range of platforms, including those with active aerodynamic profiles as well as limited downforce applications, and/or ABS-equipped as well as non-ABS vehicles, due to the direct line pressure to generated torque relationship.